Today, 25th April, marks Anzac Day, which is a national holiday in Australia and New Zealand. Just like the Pavlova, both countries claim to have invented this Anzac cookie which I find it quite amusing. Again like the Pavlova, the origin is not so clear. Wives of solders used to make these biscuits and send to their husbands, who formed part of the Australian and New Zealand Army Corps (ANZAC) as the ingredients in these biscuits kept well during transportation. 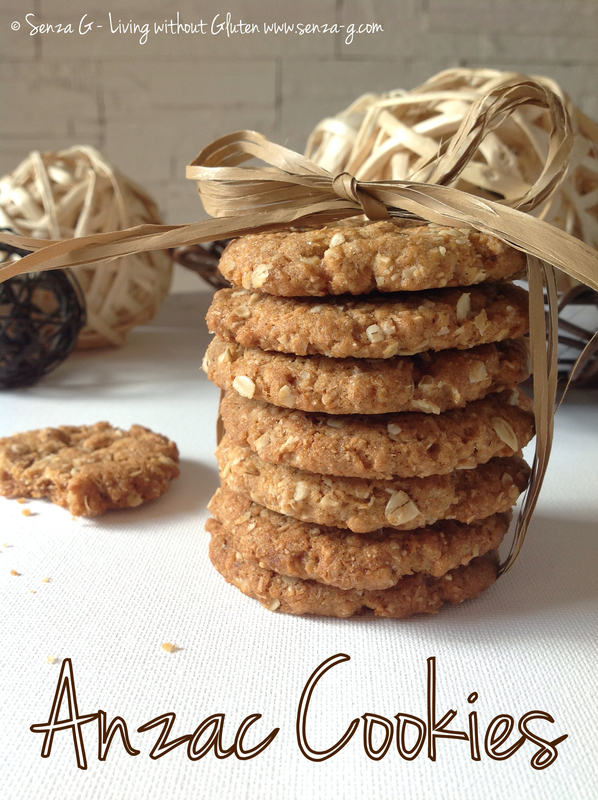 I never wait for the 25th April to make these cookies as they are so easy to prepare and taste so good! I used to make them before I was diagnosed and have now converted them to gluten free using rice flour, potato starch and Tigernut flour. Do ensure that the oats you are using ARE gluten free. Hope you will love them as much as I do! The recipe below makes approximately 30 cookies. Place the oats, coconut, brown rice flour, tiger nut flour, potato starch, sugar, brown sugar, baking soda and xantham gum in a large bowl and combine well. In a small glass bowl, melt the butter and honey together in the microwave. Add the boiling water and stir well to combine. Pour the liquids into the dry and combine well. I used my hands, squeezing so the mixture will stick together. Form equal sized little balls and place on the baking sheet, slightly apart. I used a glass to flatten the cookies. Bake in the oven for approximately 10 minutes until they start turning golden. Allow to cool, before transferring to a cooling rack.